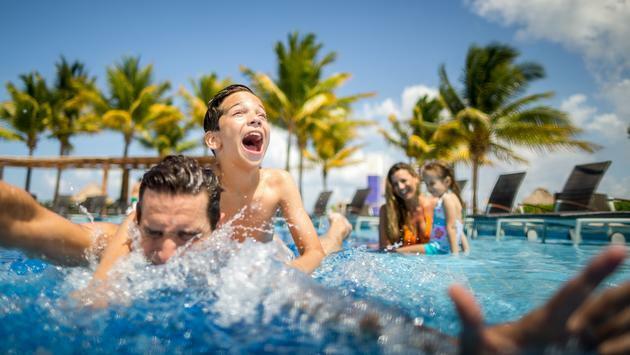 Riviera Maya is a family-friendly destination thanks to its gentle climate, relaxed atmosphere and the many outdoor activities offered, making it possible for family members of all ages to have a great time. Riviera Maya is located one hour from Cancun and 40 minutes by ferry from the island of Cozumel. You can visit the cenotes, enjoy activities like snorkeling or scuba diving or spend a day at the beach where the whole family can enjoy the crystal clear waters. The best thing about the region is that there are plenty of hotels with all Inclusive areas. Parents will appreciate not having to deal with any additional chores, and the facilities are set up with children in mind. An excellent choice for your trip is the BlueBay Grand Esmeralda by BlueBay Hotels. This luxurious five-star resort with sea views is located in Playa del Carmen. There is a wide range of water sports offered, including windsurfing, sailing and scuba diving. Children also have a kids club with specially trained staff and a variety of activities aimed at different age ranges. Once you are on your vacation, there are many different adventures in the area to discover as a family. First on the list are the Tulum Ruins, located around half an hour away by car. The Mayan temples and ruins are very close to the cliff edge, offering stunning views. Tulum beach is not far away, and you can cool off in the turquoise waters there after your walk. Family fun is also guaranteed at Xcaret park. For quieter family members there is a spectacular hammock area overlooking the sea and an aquarium, while more active holiday goers might enjoy snorkeling across the bay or floating on a rubber ring. Another great park for kids is Xel-Ha park, where there’s a giant waterslide with two slides at two different speeds. Adventures are guaranteed at Xplor park, where the visitor will feel like Tarzan. Located in the middle of the jungle, the park offers many activities with zip lines crossing over the cenotes, and there’s even a huge zip line that’s nearly 50 yards above the ground. Taking a tour on an amphibious 4x4 vehicle is another activity that offers an adrenaline rush, as they travel through puddles and caves at high speed. Spending the day in any one of these parks will leave you exhausted, and that’s why you’ll appreciate a relaxing break like the one on offer at BlueBay Grand Esmeralda. The spa on the property will help you relax before you get to sleep in one of the exclusive suites or rooms which are fully equipped with every comfort. Once you have recovered from your adventures, we recommend a visit to Cozumel Island, home to a charming little town and the second largest barrier reef in the world. As you walk through the town, you’ll cross paths with mariachi street performers, musicians and traditional dances performed by adults and children. When you return to BlueBay Grand Esmeralda, don’t forget to try the wide selection of international cuisine, including French and Italian dishes, seafood and steak. As you can see, there are many reasons to pack your bags, get your kids out of the house and take them on an adventure they’ll never forget. What are you waiting for?